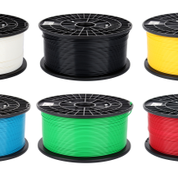 Description: 3D printer filament spool with a diameter of 1.75mm, in PLA material and coloured red. 500g weight. Please call us on 01765 691000 if you would like help or have any questions. Delivery: Delivery will be calculated in the shopping basket. Free delivery option on all UK orders. The will just drop into your printer and work, although the instructions should be followed. All our toners include chips unless otherwise stated. This is the device that communicates with the printer to let it know about your new cartridge. The PLA 3D Printer Filament Spool - red, 1.75mm Diameter, 500G is manufactured to the highest standards. This includes a quality assurance programme which has achieved the ISO9001 and ISO14001 certification. In addition, the manufacturing plant has been given several environmental awards for the handling and recycling of materials.